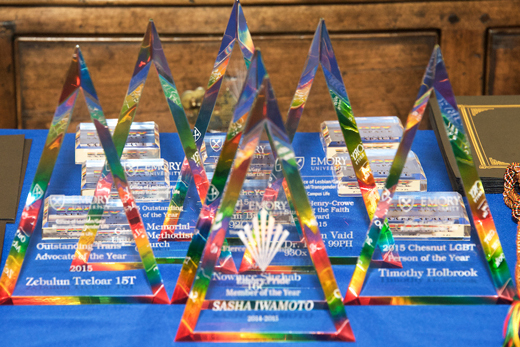 From helping transgender students use preferred identifications in student records to leading safe space training, the winners of Emory's 24th annual Pride Awards have had a lasting impact on LGBT issues. This year's awards will be presented March 3. Photo by Tom Broadnax. The Office of Lesbian, Gay, Bisexual and Transgender (LGBT) Life Advisory Committee has announced the winners of the 24th Annual Pride Awards. The recipients are students, alumni, staff and faculty members who represent the Office of LGBT Life’s mission of creating an affirming and just campus environment. The awards will be presented at the 24th Annual Pride Awards on March 3 at 6:30 p.m. at the Miller-Ward Alumni House. Awards include the Outstanding Transgender Advocate Award, Outstanding Ally of the Year Award, Chesnut LGBT Person of the Year Award, Fierce Leadership Award, Alum of the Year Award, Rev. Dr. Susan Henry-Crowe Keeping the Faith Award, and the GALA Leadership Award. In addition to the award winners, student leaders who received support from the J. Michael Aycock Leadership Development Fund and D. Daniel D. Adame Student Leadership Fund will be recognized at the Pride Awards. Finally, 2016 graduates will be recognized for their academic achievements with lavender diplomas and rainbow graduation cords. The event is free and open to the public. Returning alumni and graduating students are welcome to a special pre-Pride Awards reception starting at 5:30 p.m. Register for the event. McKenzie has been leading the Registrar’s Office for the last few years to increase access, equity and inclusion for transgender students on campus. As the University Registrar, she has spent time benchmarking with other institutions of high education, evaluating Emory’s software systems and developing solutions to enable students to use their preferred names and input their pronouns into their student records. Although the system is not fully implemented yet, McKenzie and her team have also created temporary solutions while the larger systemic policies and procedures are worked out. Hempfling worked with the Office of LGBT Life three years ago to make the Safe Space Training Program more easily available to the Oxford College community. She has taken the lead as the point person for having materials ready for trainers, offering training opportunities herself, and perhaps most importantly, coordinating training opportunities for a variety of groups several times each semester. Because of these tireless efforts, Oxford now has a significant part of the population trained — raising awareness and strengthening the community to be present as deep listeners and engaged advocates for all people. Correa is a champion of LGBT students through her extraordinary service over the years as co-chair of GALA: Emory LGBT Alumni, member of the Emory Alumni Board, member of the Office of LGBT Life Advisory Committee, and one of the founding members of the GALA Legacy Fund, an endowment to support the programs and services of the Office of LGBT Life. Her commitments to Emory have positively changed the lives and experiences of LGBT students today and for generations to come. Prior to his position in the Emory School of Law, Yoshioka-Cefalo was a student affairs staff member in the Goizueta Business School. During his time in the GBS, he partnered with the Office of LGBT Life to host a program that brought students, alumni, faculty and staff together to discuss what it means to be out in business. In addition to his leadership in Emory Law and GBS, he has served on the Office of LGBT Life Advisory Committee for three years. In this role, he provides great insight and direction to the office. Last year, Seitz made the decision to step in and serve as co-chair of GALA. As such, he worked hard to reach out and involve young alums in the organization. This resulted in large increases in young alumni participation in events such as the summer and winter socials. Seitz also co-led difficult discussions in GALA around priorities and advocacy. In addition to his leadership in GALA, he was recently called on to provide insight on the impact Emory’s diversity and inclusion had on his life to all new first-year students on the Atlanta campus. To do so, Seitz and his partner, Pierce Hand, created a video that told an inspiring story of learning, involvement and love. Over 1,400 students were directly impacted by their honest assessment of Emory. Gipson is a second-year graduate student at Candler School of Theology where he is in the master of divinity program, preparing for ordained ministry in the United Church of Christ. For two years now, he has served on the board of Sacred Worth, Candler’s LGBTQ student organization, as the chair for community engagement. In that capacity, Gipson has been a visible and vocal supporter of the LGBTQ community at Candler, helping to create an inclusive and accessible environment for learning. Above all, his active involvement in LGBTQ issues and communities transcends his work at school. He serves a UCC church that has a congregation made up of a majority of LGBTQ members. For more information, contact Danielle M. Steele at dmsteel@emory.edu.